Dahlia's Patented Purse Organizer with enhanced support helps you organize and locate items within your everyday bag with ease. Now, changing bags won't be such a chore and you won't forget to transfer everything. 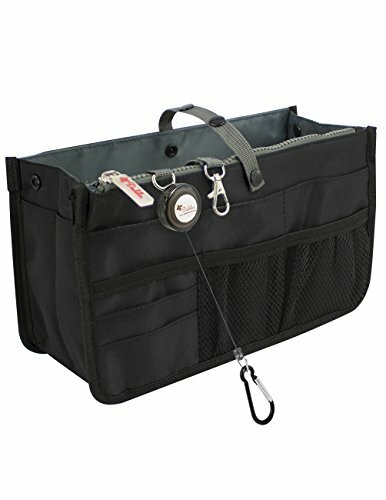 This organizer is made of sturdy, lightweight, and water resistant fabric. The thickened outer shell is 100% Nylon which allow the bag to be self-standing while the lining is made of 100% snag-free Polyester. Pockets are pleated with elastic edging for holding thicker items. Firm stitching and resilient buttons also help contribute to the bag's durability. This organizer features 21 inner & outer compartments, including 1 large zippered compartment for secure and private items; 1 open pocket designed for quickly dumping in receipts; sunglasses or water bottles; there is also an attachable hook plus a retractable keychain reel. - The retractable keychain has a maximum cord length of 26 inches long so that you can easily open the door without having to take the keys off. - Easy Access Card Holder for frequently used cards. The depth of this Easy Access Card Holder's pocket was increased from 3 inches to 4 inches to better hold the cards in place. - The stronger reinforced Crossing Band Handles are designed for multiple purposes. Besides the key function of easily transferring stuff from one bag to another, it can also serve as a clasp for the open pocket as well as turning into an extra strap hook. - This bag is about 10.9 inches long by 4.7 inches wide by 6.4 inches tall and weighs approximately 6.5 ounces; so, it won't be adding much extra weight to your bag. Dahlia has been regarded as one of the highest customer-rated merchants among sellers at Amazon since 2005. Besides our 30 days Return Policy, Dahlia offers quality assurance to ensure your risk-free shopping experience. If there are any issues, please contact us directly. Your feedback and suggestions will help us improve our products and provide better service.